A chapter in Tualatin Valley Fire & Rescue’s history is coming to a close with the retirement of the last Tualatin Rural Fire Protection District firefighters. Battalion Chief Jeff Cooper, Capt. Virgil Hall and Lt. Daniel O’Grady served with the Tualatin Rural Fire Protection District when it merged with Washington County Fire District 1 in 1989 to form Tualatin Valley Fire & Rescue. At the time, the Tualatin Rural service area included Tualatin, Sherwood, Tigard, King City, Durham, Rivergrove, Wilsonville, and unincorporated areas in Washington and Clackamas counties. 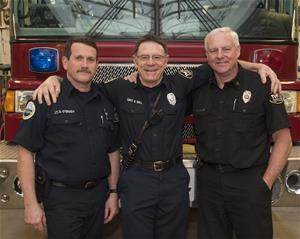 A great deal has changed in the nearly three decades since TVF&R’s beginning, and the three Tualatin Rural originals had frontline positions allowing them to watch the area’s transformation and experience the evolution of the fire district. They each took time to share their perspective of the early days of the district as Tualatin Rural and District 1 firefighters combined forces and reflected on their time responding to emergency calls in the communities TVF&R serves. “We started training together and learning new ways of doing things while sizing one another up,” recalled O’Grady, who was hired as a firefighter in April 1985. Two things firefighters from the founding districts shared were a desire to help people in the community and an appreciation for having a job in the fire service during uncertain times. “In the ’80s, Oregon was in a recession, and no one was hiring,” said Hall, who was one of four firefighters hired by Tualatin Rural in April 1983. “You would score well on the test to become a firefighter and never get a call. If you were one of the lucky ones to get a call, you pounced on the job. In the early days, firefighters worked on two- or three-person truck companies rather than the four-person crews TVF&R has today. Firefighters also performed fire inspections of area businesses completed today by deputy fire marshals and tested hydrants. With new development and steady population growth in the area came increases in service demands that prompted the district to shift some firefighter responsibilities. Sherwood, Tigard and Tualatin were “sleepy towns,” Hall added. The fire service itself grew and adapted right along with the communities. While riding in the back of the engine had its charm, being out in the open exposed to the elements while traveling to calls was less than ideal. “When we merged, we received nicer apparatus and safety equipment,” O’Grady noted. “Back in the day,” added Cooper, “there was no hearing or eye protection, no medical gloves or face masks, no system in place to document exposures to bodily fluids, and we performed mouth-to-mouth resuscitation. The merger improved personal protection, scene organization and safety practices and equipment. In time, the addition of support staff, expanded services and rescue teams, ongoing training and continued community support enhanced efficiencies. As the last of the Tualatin Rural firefighters edge toward their final duty shifts, they admit it will be hard to let this chapter in their professional life come to a close. He said he still wakes up looking forward to going to work, seeing his crew at Somerset Station 64 and driving to calls wondering what his crew will find. O’Grady worked his final shift at Tualatin Station 34 on Dec. 30, 2016.